Lane LLC was founded by Cory Johnston and Brady McDonnell in 2007. Cory was head of engineering for Diamond Mowers, Inc. for 11 years until he returned to West River South Dakota to design and build suppressors full time. Brady McDonnell graduated from Colorado University and moved back to South Dakota to pursue multiple business interests and to help run the family farm. Both are avid hunters and gun enthusiasts who want to support and make a mark on the firearms industry by creating products that surpass current standards. Our mission is to use high standards and innovative thinking to design and produce high quality products that appeal to the public. We will use the best technology available to ensure high quality and lower customer costs. 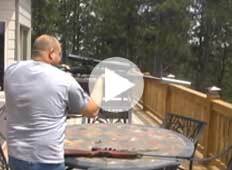 Watch this demonstration of an air gun versus a subsonic .308 featuring a Lane suppressor.